It’s that time of year when people are having lots of celebrations, and we’ve been blessed to have our share of them over the past several weeks. We were overjoyed when the grandgirls came for a visit. 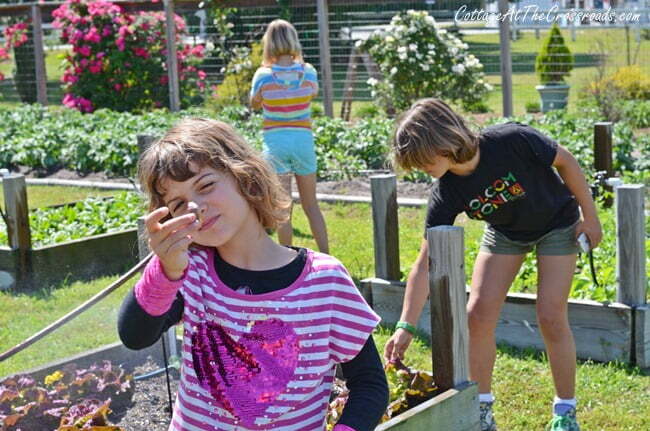 They love being in the garden and helped us pick some things for dinner as well as some flowers for the table. They were here for an early celebration of Leo’s birthday. Then, of course, we had to celebrate on his actual birthday. 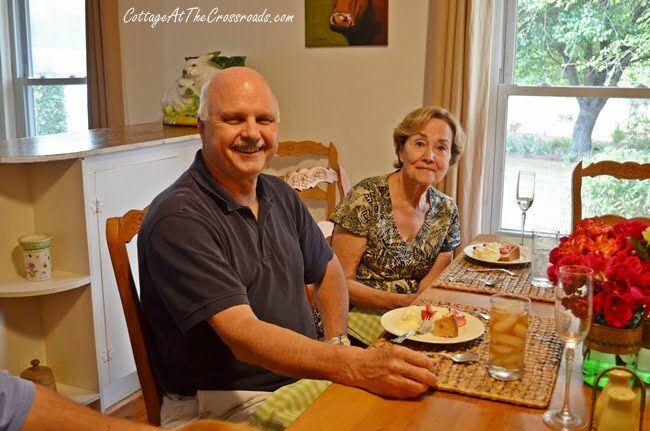 His brother Jim and his wife Jean grilled steaks and I made some carrot cupcakes that we enjoyed for a few days. 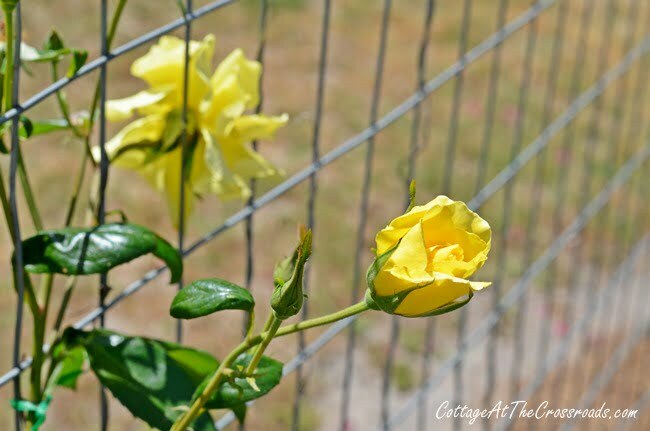 And I’ve been celebrating the small things in life such as this yellow climbing rose that’s blooming now. It looked dead earlier this spring, but I fertilized it any way, and it’s sending up some shoots. It’s been extra dry here for a few weeks, so we’ve been busy keeping everything watered in our yard and garden. We celebrated another Mother’s Day this past Sunday, thankful that we have another year with my mom but missing Leo’s mother whom we lost 5 years ago. In addition to keeping everything watered, we’ve been spiffing up the place because we were expecting visitors to The Crossroads. Leo put a new coat on the white fence that surrounds our home. 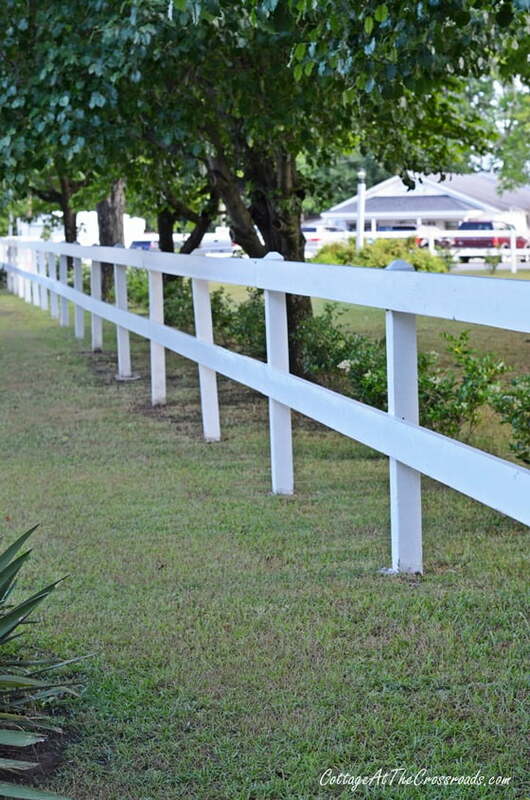 It’s a yearly chore that must be done but we wanted to have the fence all clean and bright in time for the visit. The flower pots on the wooden posts got freshened up with new flowers and a coat of white paint. 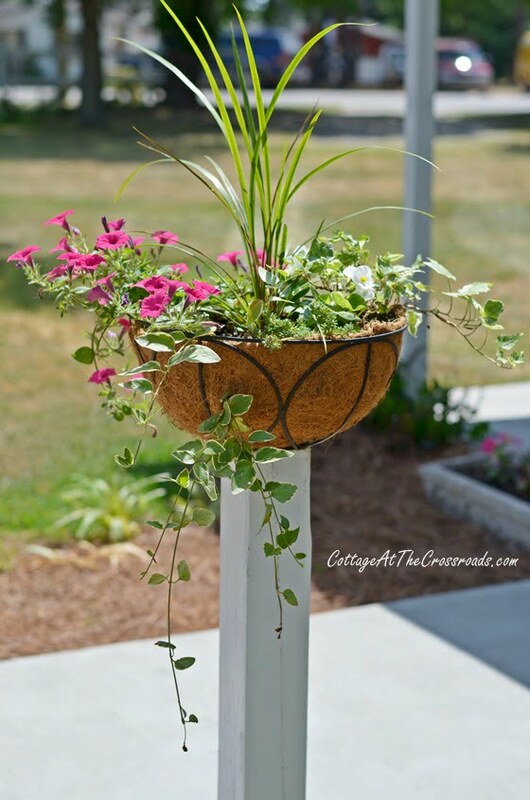 There are 5 of these baskets in front of my mother’s apartment in the yard, and you can read our post How To Mount Flower Baskets onto Wooden Posts to see how we made them a few years ago. The whiskey barrel planter in front of the shop got planted with flowers as well as the window boxes that you can see in the background. 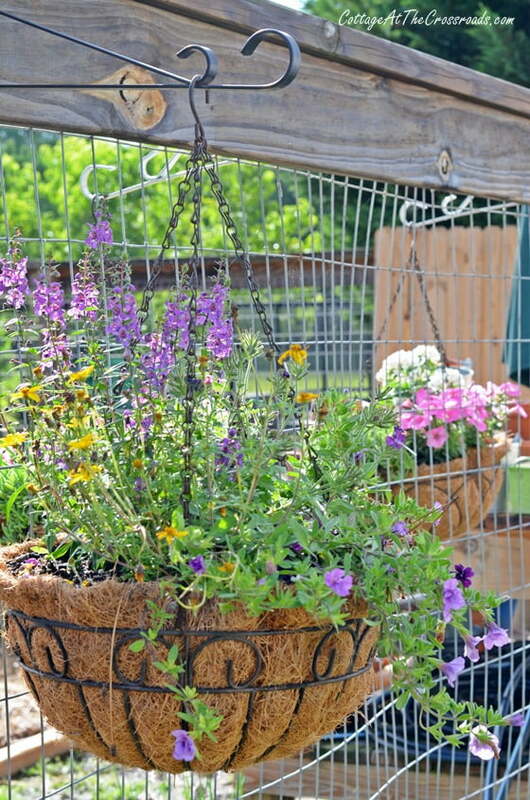 I always have some hanging baskets at the entrance to our garden and inside as well and those got put together rather quickly in anticipation of our visitors’ arrival. The carpet on the front and back porches got cleaned which gave me an opportunity to rearrange a few things. 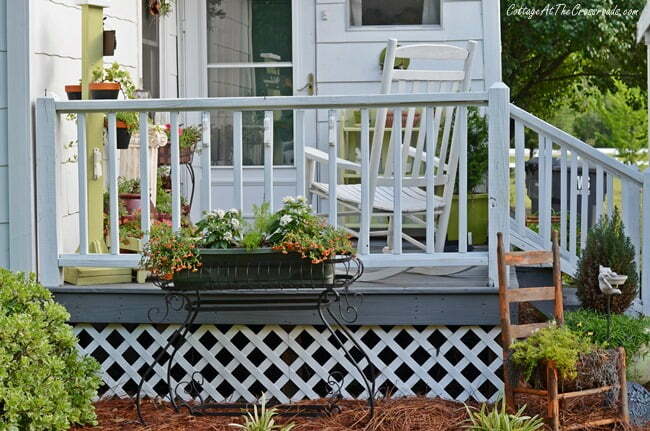 The metal planter and the white rocker that are usually on the front porch got moved around here. This is a wooden berry box that I picked up at the auction a few months ago, and I painted it green to match the plant stand behind it. When those ‘million bells’ spread and fill in, it will look really pretty! 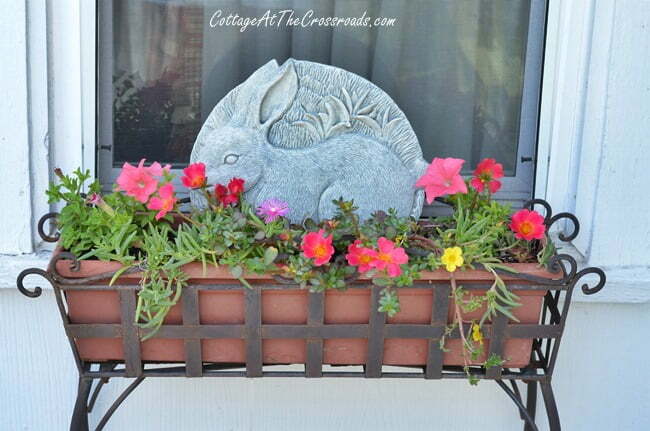 Another planter that I keep on the deck got fresh flowers and a bunny. 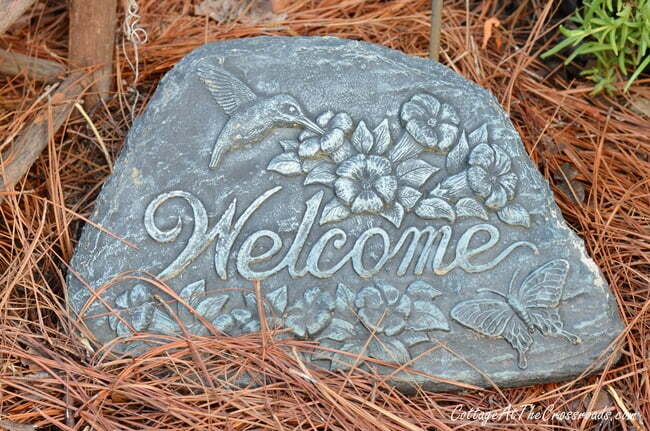 All of these preparations were made to make our visitors feel extra special and welcome. You may remember the story I told you about the other Jane Wyndham when we were doing the Featured Follower series on the blog. I met Jane online, and we not only share the same name but so many other similarities. Jane lives in Idaho and she had emailed me that she and her husband would be in North Carolina attending their grandson’s graduation from Duke. Since they were so close, they decided to drive on down to the Crossroads so that we could meet in person. And they arrived this past Monday afternoon. We felt like we’d been friends forever, and Harald and Leo had plenty to talk about since they both enjoy gardening and music. Who would have ever thought that you could develop friendships on the Internet and feel such a close bond with people you’d never met previously! But when you actually get to meet one in person, that is really special. I fixed a nice meal to celebrate our visit (no one comes to the Crossroads and leaves hungry!) Harald especially enjoyed the creamed garden peas made with the first picking of fresh peas from the garden. 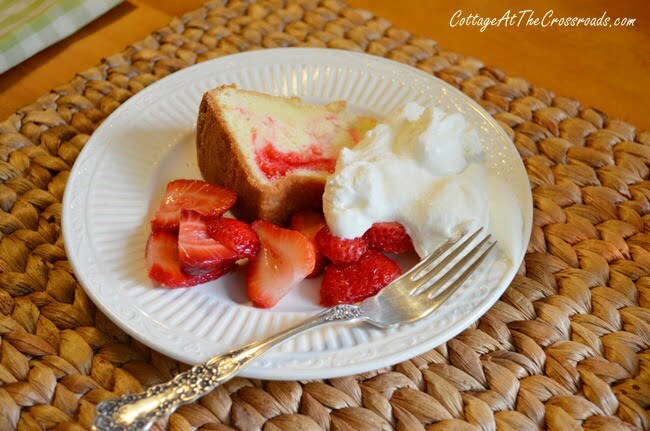 Leo’s brother Jim and his wife Jean joined us for dinner, and Jean brought over this yummy pound cake with strawberries and whipped cream. We had such a great time together and I’m so glad the Internet brought these wonderful people to the Crossroads. As always, we love and appreciate all of our readers of the blog. Life, family, and cyber friends are causes of celebration! 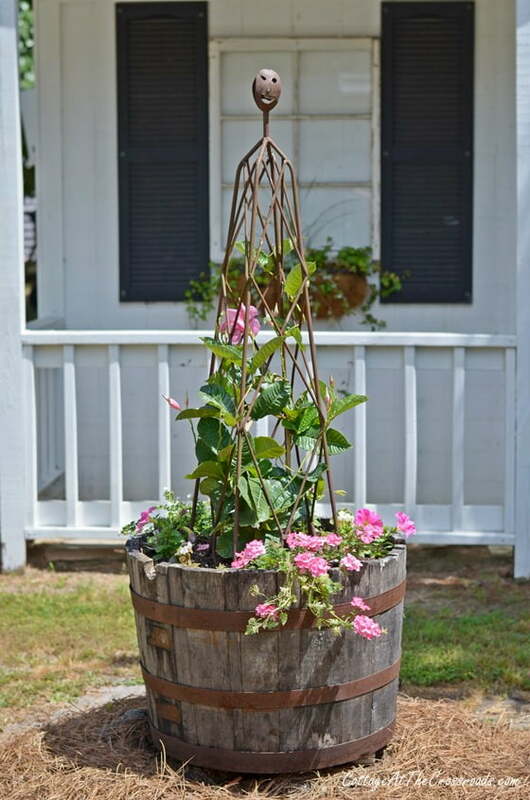 What flowers do you have planted in the whiskey barrel? I need something that climbs. Such lovely celebrations…that’s the good stuff of life. And so fun to meet an online friend in person! Too cool! 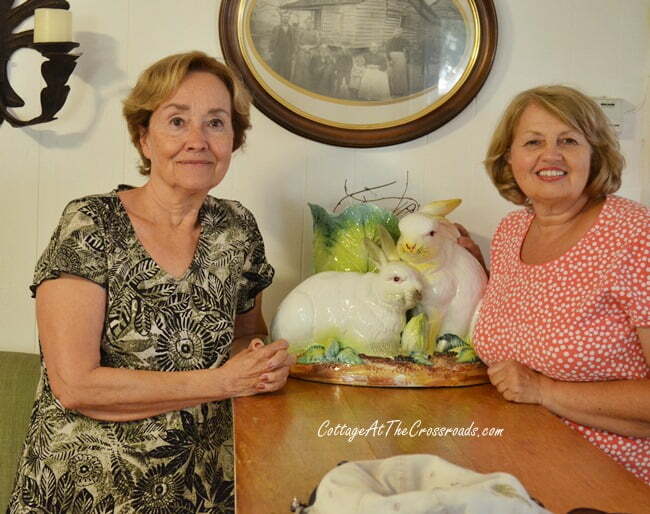 Btw, I just have to ask about the bunny rabbits in the picture, gorgeous. I have never seen any ceramic one that big who is the maker? How fun! Everything looks great as usual! I thought about you recently when we were on our way to the beach and stopped to get gas. As we pulled off the interstate there was a sign that said “Lamar” and I can’t remember the number of miles but it was just a few! I wondered if I could pick out your house by the garden! Oh how wonderful Jane! You and Leo sure have been a busy team together. I love it all, such wonderful inspiration. You two certainly have been busy and what a cool story. I love it 🙂 I have been told someone who looks jus like me lives in the next town but I have never seen her. I bet you had a fabulous day and all the flowers are fantastic, like always. 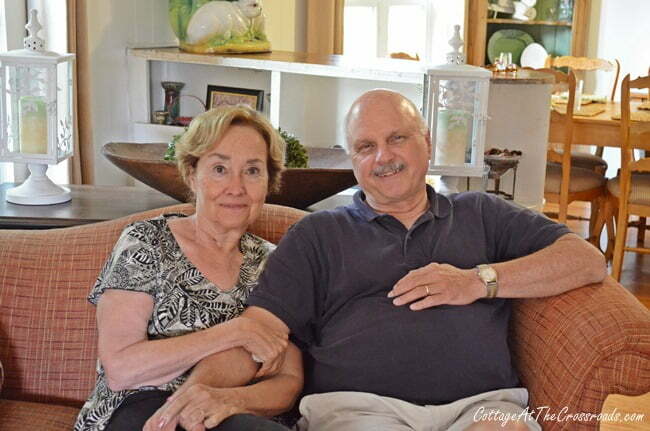 How wonderful for you to get to meet Jane and her husband. Celebrating friends and family are truly the best things in life. 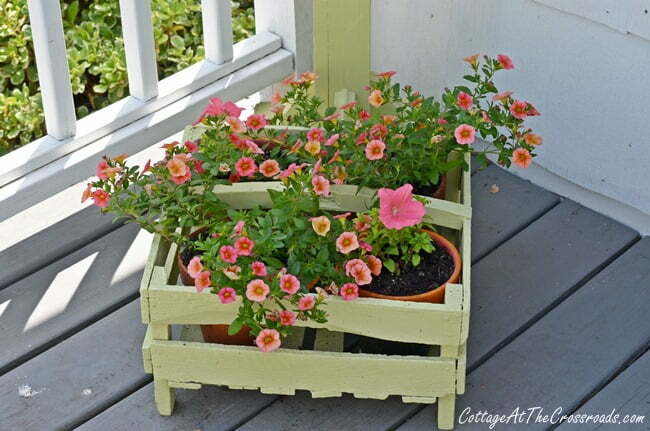 I do love your flowers blooming about the yard and porch. It will be a while before my perennial flowers (what’s left of them after the bitter winter) will really take off and start blooming. We had another lite frost last night. Last year we had a hard killer frost on May 31st while we were on vacation that killed the annuals I had just planted before we left. I will wait another week or two before I put in my annuals this year. For now I will be content to look at your lovely blooms. Thanks for sharing your celebrations. Have a good Sunday. Such wonderful things going on at the Cottage!